We will control the horizontal. We will control the vertical. For the next hour, sit quietly and we will control all that you see and hear. Roger Waters third post Pink Floyd album, “Amused to Death”, was released in 1992. Like most of Water’s albums it was a concept album. The running them in this one was of a monkey watching TV and changing the channels. Recently Waters described his younger self as a “Poor, Miserable F’d up little Roger from all those years ago.” Indeed when you listen to Water’s 80’s and 90’s albums he comes across as very angry at the world, especially all governments and “the establishment”. He also is obviously very disillusioned with pretty much every aspect of Western, capitalistic society. The specific focus of Water’s anger and disillusionment in “Amused to Death” is how society is controlled/influenced by TV and the mass Media. 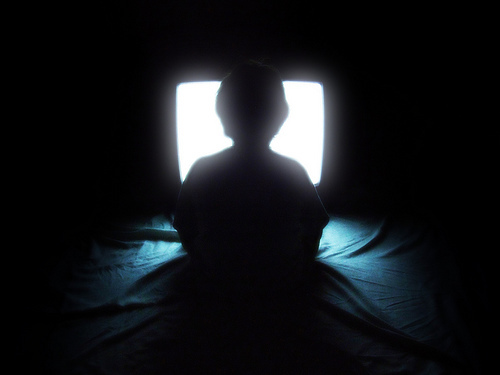 While the image/idea of “Channel Surfing” may be a little dated (or maybe not) the themes of influence and control of mass media is very topical to today as is the idea that we so brainlessly respond to what we see while “Watching TV”. As for our connection with the Tiananmen Square massacre – the song describes a viewer (embodied in a fairly brainless monkey) who is “watching TV” when he sees a young woman who has been protesting in the Square get killed. The song challenges the listener to think about what they do when they witness such events. When we see injustice, do we do something about it? When we see a hungry person, when we see a suffering child, when we witness a loss of civil rights, when we watch oppression and slaughter – do we take action, do we let it change our lives, do we try to help, do we get off of our butts and try to make a difference? Or do we continue to mindlessly play with the remote stopping only long enough to order a pizza or microwave a burrito? Do we let what we see influence us to take action to try and make the world a better place or do we continue to enjoy our comfort while others in the world suffer? From the song Roger’s concludes that most of us do nothing but continue to watch TV and he is going to let us have it for making that choice. As an interesting and contemporary note, at one point in the song Water’s describes his semi fictional character as a “student of philosophy”. In 2009, Neda Agha-Soltan, a student of philosophy was murdered in Iran. She was a bystander at a protest when she was shot by a sniper. Her death was caught on camera and broadcast over the internet. After it happened Komeil Bahmanpour, a well known Iranian “entrepreneur, software architect and author” pointed out the similarities between Neda Agha-Soltan and the “Watching TV” character on his Facebook page which caused a bit of a stir at the time. See here for more details on Neda Agha-Soltan and her death. SO what will it be after tonight’s news of the world? More TV, more pizza, a movie, a video game, etc? Or will you be moved to social action?